Troy Kitchen has come a long way since its opening last year. The space is more polished, with a varied mix of seating from booths to communal tables and window-facing counters to a lounge area with just enough room to dance when a band or DJ is on stage. The food options reflect that progress. In the first year, the menu darling that was the biggest draw was the beef bulgogi from K-Plate. It's since rotated out of the Troy Kitchen repertoire, but Bespoki Bowl -- a poke/seasoned raw fish vendor -- continues to serve the "K-Plate" beef dish. Magdalena's Menu is another holdover from the first class of Troy Kitchen vendors, but three others have come forth to occupy booth space and are starting off their tenure with a bang. Street food is finally getting its due credit, and NYC-style halal carts are top among them. Kebab (seasoned meat -- here, chicken or lamb -- on a stick) and falafel (the chickpea and/or fava bean puree that is formed into a ball and deep-fried) are the building blocks of the Halal Palace menu. A gyro sandwich ($5) wraps the kebab or falafel in a warmed pita with fresh lettuce and red onion before a drizzle of "white sauce," which blends mayonnaise or yogurt and lemon juice with warm Middle Eastern spices like caraway, sumac, cardamom and a dash of turmeric. 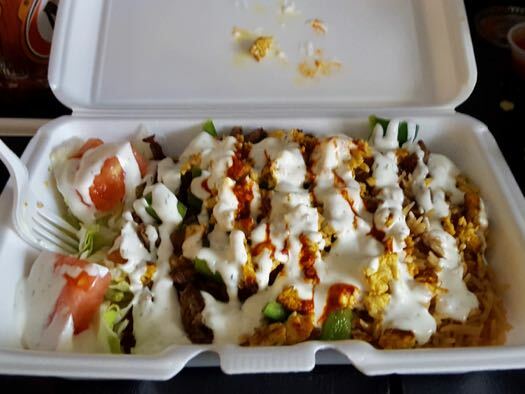 I'd suggest you try the lamb and chicken platter ($6), served with seasoned rice and both white and "hot" sauce, which uses the pungent toasted flavors of harissa pepper paste as its base. 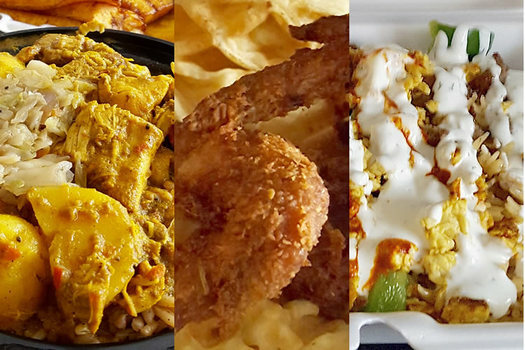 If you're new to Middle Eastern or halal cart dishes, the platter is a great primer on the flavors of the cuisine. Whenever I hear "soul food" or "grandma" when it comes to a restaurant, I cringe a little. More often than not, those terms are gimmicks designed to draw people in, but rarely deliver. Not the case at Grandma G's. Southern-style fried chicken wings (that is, the actual wing with tip included. No drumsticks here) ($6) are punctuated with seasoned salt and paprika, double-dredged before a trip into the fryer. Mac and cheese is a buttercup yellow color, with real butter, cheddar and American cheese, and creamy milk. Collard greens are perfectly tender, and never stringy, with a briny pop from a last-minute kiss of vinegar. Wedge fries come in a generous portion and are seemingly blanched, then fried, for a creamy mashed-potato-like interior and a crispy exterior. I can't wait to try the candied yams. 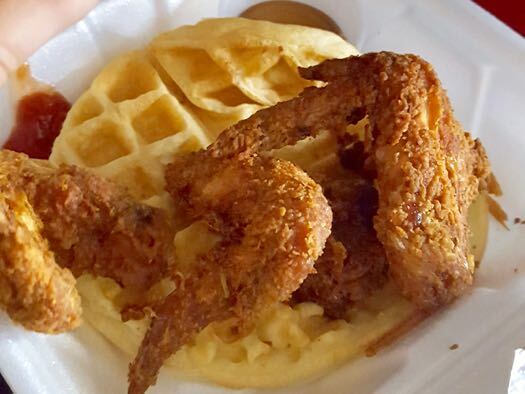 The waffles were a bit undercooked to my liking, but all sins are forgiving with a taste of the umber-colored hot sauce, a spicy variation on honey mustard married with Carolina-style BBQ sauce. Caribbean food is booming in the region, and M&K Island Hut is a good example of why. 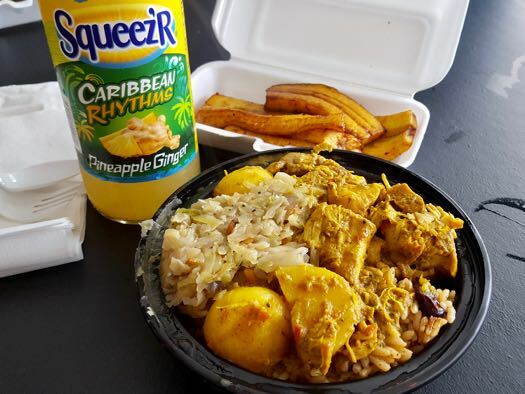 Rough cuts of curry chicken ($6) and small, skinless white potatoes are slow-cooked and tinged with the spices of maritime trade routes. Allspice -- a hallmark of Jamaican food -- is abundant and paired with coriander, cumin, anise, and mustard seeds so vibrantly, it tastes as though the spices were ground fresh to order. Pigeon peas and rice offer subtle hints of coconut. Cabbage and carrot are stewed together to bring out the carrot's sweetness, foiled by garlic and paprika. Fried sweet plantains ($2) are cooked at peak ripeness, seasoned with little more than citrus and salt, melting on the tongue with every bite. There's much to love at Troy Kitchen, but perhaps the fact that it even exists is reason enough to appreciate it. The chance to try a new cuisine for a very reasonable price is a treat, and if you don't like what you ordered, simply walk up to another booth. There are a few vacant spots yet to be filled (the bakery portion left behind by Butter and Sugar company begs for an ice cream or confectioner to step in) and a chopped cheese vendor is slated for the fifth booth. But whatever arrives in the next phase of Troy Kitchen, no doubt it will expose our palates to new and exciting flavors. I wish Troy Kitchen would create a website with the menus of all the vendors. This would be helpful for everyone, but especially for vegetarians, vegans, and people with other dietary needs, who need to know whether there are options for them there. All that styrofoam...and plastic...for eat-in...why? Makes everything look a lot less appetizing, as well as leaches plastics into the food. I wish Troy Kitchen would invest in re-usables. If you need some ice cream or even better, a Dominican icey after Troy Kitchen, you only need to cross Congress Street over to Cory's uncle's spot...CoCo Mango. @Diner and @jo -- I agree with you on both counts. I know TK is basically a landlord situation, and each vendor is a renter, but it would be nice to have some consistency. You can't really find what's actually being served on the TK Facebook page, save for a few photos. And maybe the owner could have some sort of condition as part of the lease of the booth space that vendors must use compostable/made from recycled materials/environmentally friendly products for service. All in all, it would lead to a better customer experience, I think. Complete up-to-date menus would be fantastic. Also agree 100% about the styrofoam containers. Even McDonalds stopped using them 20 years ago. I went there for the first time last night and it was so freaking awesome. I see comments about the containers, maybe that plays a factor in keeping the cost so reasonable. I loved the whole ideal and the atmosphere. I spoke to all of the owners, and they seemed very happy. There is nothing like talking to someone who loves where they work, that makes a better cook. If I wanted unhappiness and real plates - I would have cooked! LOL I will be back. I can't wait to attend an event, jazz or poetry.